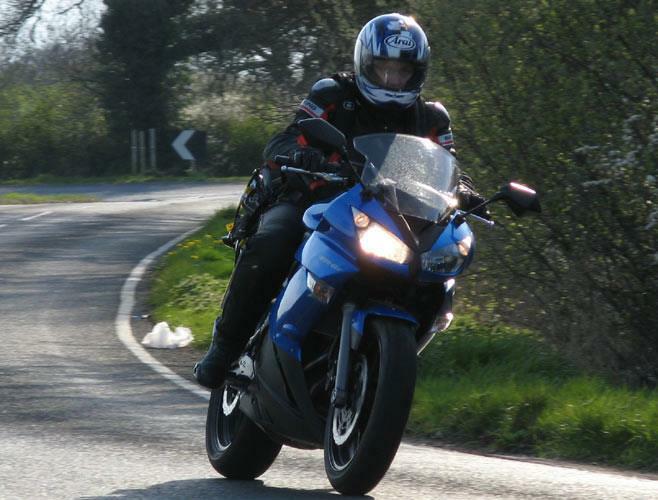 If you are new to biking there are lots of fresh sensations to get to grips with, from leaning into bends, to the front dipping under braking or that pull on your arms as you accelerate hard. One strange one you may come across is a shake through the forks at certain speeds, mainly between 40-50mph and mostley when you are decelerating. This is a low-speed shimmy. A shimmy is a left right vibration, or if you like, a headshake that occurs when decelerating. Low speed shimmy (there’s also something known as high-speed shimmy) usually appears when decelerating between 50–30mph. It can appear when riding in straight lines and corners. Frequency (how fast it vibrates) is about 5-10 Hz (cycles per second) and the amplitude (how big the shake is) can vary but can get worse if you don’t regain control of the handlebars. It also manifests easier when the tyre is cold. Shimmy can also be more evident with a heavier load. Not all bikes suffer from shimmy and some bikes only suffer shimmy when fitted with certain types of tyre. Depending on the bike/tyre combination it can manifest naturally, which can be seen when you simply let go of the handlebars and let the bike coast down through 50–30mph, or it can sometimes be induced by letting go of the handlebars at the same speed and striking one of the grips from behind. Tyre related contributing factors can include inflation pressures, how worn the tyres are, tread pattern design, compound characteristics and casing design and stiffness. Mechanical related contributing factors are tight or worn steering bearings. This is what the Dunlop chaps have to say on the subject…..
“When we test for shimmy we test under 'worst case scenario conditions', which is when the tyre is cold. This is because the tyre's compound is stiffer when cold as less able to 'absorb' the shimmy. This can also be the case with a stiff tyre construction - a softer casing may be more able to 'absorb' a shimmy. You may well ask why we don't make all front tyres compliant enough so that shimmies could never be a problem again. Well, the contradictory area of performance to shimmy is high-speed stability and if a tyre is made compliant enough to deal with all shimmies on all bikes it's unlikely to be sufficiently stiff enough to give good stability at high speeds, and it's also likely that it would have mushy steering response.